This book is available from Amazon in softcover and e-book (kindle edition). Santa Fe, New Mexico's long and glorious history has enlightened, delighted and often frightened New Mexicans and visitors alike. But our fearless author embarks on a playful recounting of the events, the people and their leaders. He pokes innocent fun at everything that moves: the government, the church and the institutions of higher learning. For example, few people know of the manual dexterity of Kit Carson, the underground excursion of Don Juan de Onate and the husbandry skills of Bishop Lamy, to say nothing of the real truth behind the taking of Santa Fe by the Army of the West. 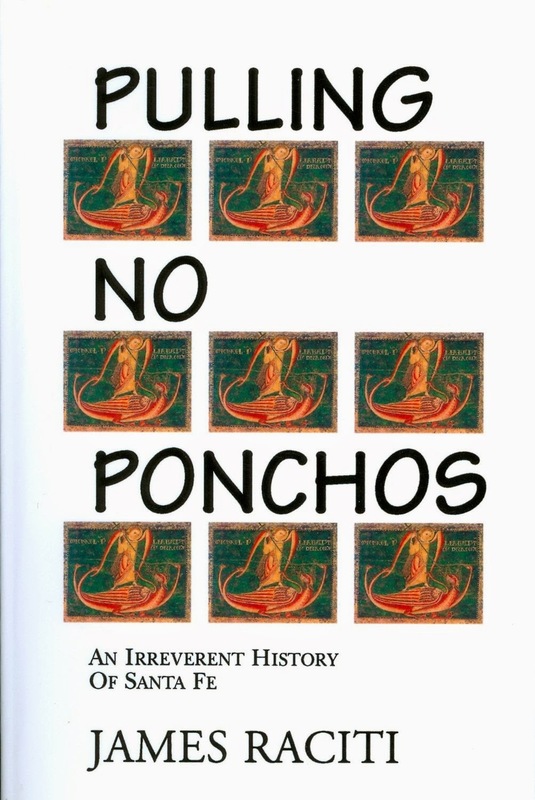 But you will after you read PULLING NO PONCHOS. And you'll be glad you did. JAMES RACITI has lived in Santa Fe for several years and has enjoyed tweaking the sensitivities of its inhabitants. A native of Philadelphia, Pennsylvania, Dr. Raciti has spent more than twenty-five years in Europe as an educator. He has written two books of poetry, "Charles" and "Dabs of Myself" and has written and produced two plays, "The Song of Roland" and "Invitation at Dawn: Ernest Hemingway." His first novel, published in 1999, is entitled "Au Revoir a la France." His most recent novel is "Giacomo," published in 2000.